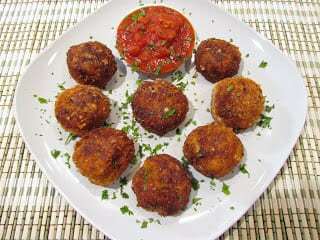 Traditional Arancini are deep fried rice balls, coated with breadcrumbs. 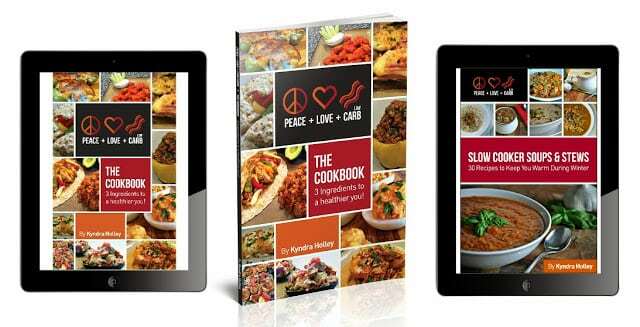 I recreated this traditional version into a delightfully sinful, low-carb version using riced cauliflower instead of rice. To make this gluten free, simply replace the panko with extra pork rinds. You can put any number of ingredients inside. I went with a couple of my favorites…. LOTS of cheese and bacon. Hope you enjoy them as much as we did. 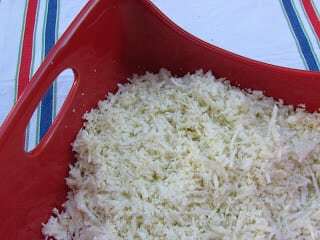 To rice the cauliflower you can pulse it in a food processor or even just use a cheese grater. I used a cheese grater. 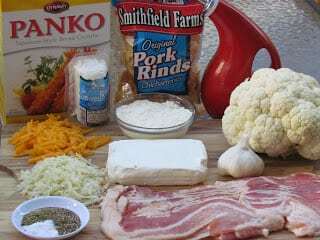 In large mixing bowl, combine riced cauliflower, bacon, softened cream cheese, goat cheese, sharp cheddar cheese, sharp garlic white cheddar cheese, 1/2 cup grated Parmesan, minced garlic, 1/2 tsp. Italian seasoning, sea salt and pepper. 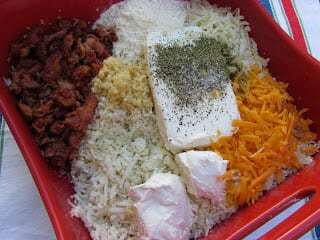 Mix until all ingredients are well incorporated. Refrigerate 1-2 hours to allow to firm. 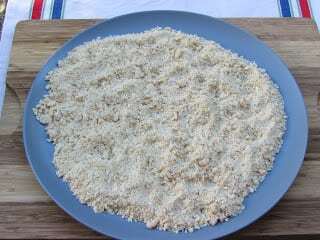 Combine crushed pork rinds, remaining 1 cup Parmesan cheese, Panko, remaining 1/2 tsp. Italian seasoning, onion powder and garlic powder. This mixture will be your breading. 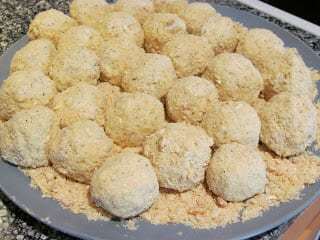 After cauliflower mixture has had time to chill and firm, roll mixture into even balls. I made mine approximately an inch and a half to two inches in diameter. This made 30 balls. Freeze for 3 hours, up to overnight. 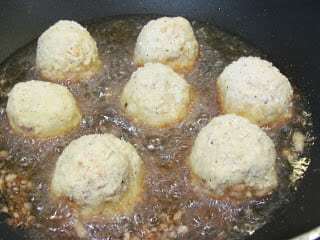 In a large pan, heat about one inch of oil over medium-high to high heat. Using different oils will change the temperature at which you should heat it. Be sure to check the smoke point for any oil you choose to use. When I am frying things stove-top I use my non-stick wok. The high sides help prevent splatter and it makes for easy clean up. 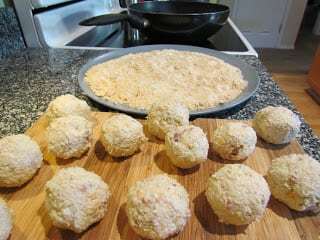 Roll each ball in breading mixture until well and evenly coated. When oil is nice and hot, drop balls in 5 or 6 at a time. It will be obvious when it is time to flip them over. Fry until they are a nice even golden brown all over. Remove from oil and let cool on a paper towel. The paper towel will soak up excess grease. 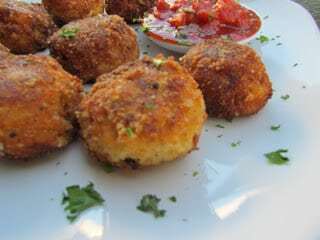 I served these with a low-carb marinara and also ranch dressing. They both made for great dips. Protein: 19 g***Here is a little hint. 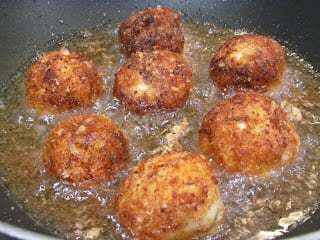 They are great reheated in a non-stick pan with a little oil or cooking spray. My husband and I fried them and topped them with over-medium eggs the next day for breakfast. Simply delish! These look great but curious to how all the bacon in your recipes is affecting cholesterol levels? My doctor has cautioned me about animal fats though my overall levels are good enough. Thank you! Been dreaming of these all week.. any chance you can post the nutrition info? Sorry…I know its a pain. Question…Do you think these can be fried in a deep fryer to cut back on turning? I have all the ingredients to make these bad boys, but one question. When you say “riced cauliflower”, Kyndra, it makes me think of my potato ricer. In order for that to work the potatoes would be cooked and then riced. There are no directions for cooking the cauliflower…so I’m guessing I just shred the cauliflower in a food processor raw? 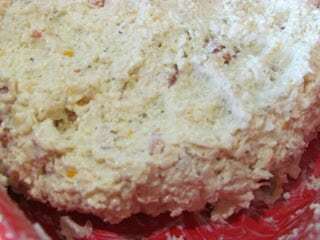 To rice Cauliflower you put it in a food processor raw. Pulse until a rice texture. Put in a bowl in the microwave, no water and cook for 8 minutes. Yes. You shred it raw. Amazing, just made these now 🙂 Can’t wait to bring them to work and share!